Every once in awhile, life gives one a gift. My friend, Marie Howell has done that. She is in her own transition from a long-time career to the call to create art. She has documented this on her blog www.ariteofpassageinpaint.com. Recently, she wrote about my journey as well. The interview follows here...and the paintings she refers to are elsewhere in my blog...you’ll find them easily. The one you see here may well represent The Sovereign - a woman of wisdom, power and healing. “You can do anything you want.” When Shirley Cunningham heard those magic words, spoken to her by a teacher in an acrylic painting course years ago, there was a shift and knowingness inside that propelled her to embrace her creative potential full out and full steam ahead. And she’s been proving her teacher right ever since. 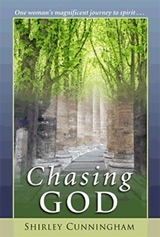 Shirley is a writer, workshop leader, spiritual director and certified counselor. But the role she embraces with her heart and soul is artist. We met a couple of years ago through Cosmic Cowgirls’ Leading a Legendary Life online course. There were twenty women in the class from all over the country. Shirley and I were paired as partners and soon realized we live about 5 miles apart! We have become art cheerleaders for one another and still meet to share information about art websites, workshops, and opportunities to promote our work. Shirley has written a book about her life journey entitled “Chasing God.” In it, she describes how, while recovering from breast cancer, she was guided to create pencil portraits of family members. The first was “”Grandma Cunningham,” pictured elsewhere on her website, which she drew with the photograph she was using as a reference turned upside down. As she undertook her healing journey and recovery, she became aware of the grief of the lost little girl inner artist and how she had slipped into the background in her pursuit of other activities. Shirley came to recognize that this grief and other life hurts needed healing so her body could also heal. This was a turning point in her life as she fully understood the power of the body/mind/spirit connection. Eventually the series of family portraits “appeared on the blank white sheets in front of me, effortlessly, as if they had been politely lined up, waiting for me to release them with my pencil. “ Shirley learned to deeply trust her intuition. She disregarded earlier inner critic messages about not being talented enough. She was hungry to learn all she could through continued practice, workshops and classes. And Shirley’s emergence as the creative force she is today began. Her style is largely centered around archetypes, symbolism, and the metaphysical which she studies in both her personal life and in her professional role as a therapist. 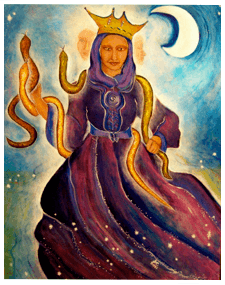 She sees her own primary archetype as The Sovereign, a woman who knows her wisdom, power and influence, is willing to take a stand, and is between the Mother and Crone stages of life. Creating art has become a spiritual practice for Shirley, something she “needs to do” for her own wellness and growth. She even notices that painting complements her clinical practice. After a long day she is renewed and restored by creating beautiful art and is able to be totally present and more centered in her work life as a result. Shirley ‘s “Dragon Rider” personifies her understanding that archetypes are integrated and can’t be separated. The image incorporates the artist, the seeker, the doubter, the warrior/ gatekeeper, and the sovereign. Shirley feels this speaks of her life. Is the woman subduing the dragon or is the dragon her ally? Immerse yourself in this work and the others on Shirley’s website and see what answers become true for you. Thank you, Marie, for the salute!